It was there from the very first note: that fine, silky, supple Hadelich sound, and within a very few bars, the violinist had again proved that not without good reason is he held as one of the most discriminating exponents of his guild. The Ex-Gingold Stradivarius once belonged to the famous violinist and teacher Joseph Gingold […], who gave the first performance of Ysaÿe’s third solo sonata (“Ballade”) on it. 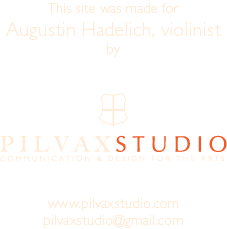 Hadelich played it – and how! The jubilation in the rising figure at the start was like life celebrating itself. Ysaÿe’s Sonata no. 5 was pure madness. Joie de vivre – one almost hesitates to put it in German: Daseinsfreude, the joy of living. […] In the Caprices nos 4, 9 and 21 Paganini emerges from the shadows of “devil’s violinist” as a remarkable composer and reveals the agonies of unfulfilled desire, passionately depicted. Hadelich plays these with greater seriousness than is usually the case; he does nothing merely for show. In Bartók’s great sonata, likewise, superficial brilliance has no place; the cantabile element is part of an existential desire for self-expression. Playing the violin is communication, and everything in Hadelich’s probing playing happens because of what is in the music. He brings it to an incandescent glow, but not a destructive one. On listening impartially to five recent recordings by aspiring and indeed much-feted young violinists, we have to report that none of them has such a substantial tone, so imaginative an approach to instrumental sound and such timeless beauty.